I remembered reading these verses because I had underlined them and thought about how God is so faithful–He doesn’t make promises He won’t keep. And He is totally in control–He does what He says He will and it will happen when He says it will happen, in His perfect timing. Because He is faithful and all-knowing, we can totally trust Him to work in ways that are best for us in every area of our lives. That’s a comfort to me and I hope it is to you, too! This entry was posted in Inspirational and tagged Genesis 21:1-2, God's promises, Proverbs 30:5 on February 8, 2015 by nancyc. Thank you for your insightful sharing of God’s word. We need this everywhere in our lives in today’s world. Oh this is just what I needed. Thank you for sharing! That is just what our pastor talked about today. He was talking about prayer and why sometimes we have to wait for the answer to our prayer. This is such a good reminder. Thank you! How true, and it’s hard to wait for those answers sometimes, isn’t it? 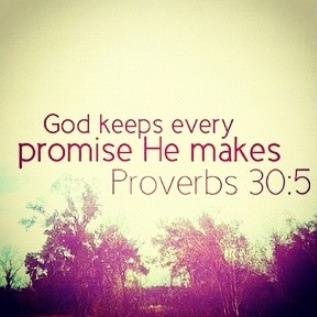 Knowing that God always keeps His promises makes waiting for His answers a little easier!